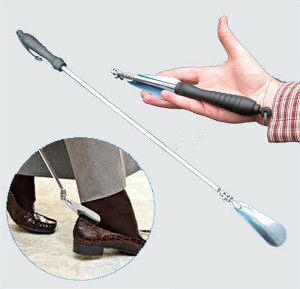 Shoehorn adjusts from 10"–24" in length and is ideal for packing in a suitcase or overnight bag, or to take to the store when trying on shoes. The angle of the shoehorn paddle can be rotated and tilted for the most comfortable use while standing or sitting. 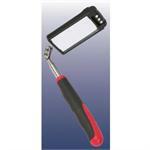 Has a leather hang strap attached to the black plastic handle, and a metal telescoping shaft. Shoehorn itself is steel, with a chrome finish.